Click to download or view the invitation in order to print. Or, simply RSVP to us at CampBethelOffice@gmail.com or 540-992-2940. Christmas TOGETHER Banquet will the repair and restoration of the Ark Pond. Help fund the repair and restoration of the Ark Pond! Please donate to our Christmas TOGETHER Banquet for an excellent dinner in our festive, decorated Ark Dining Hall. 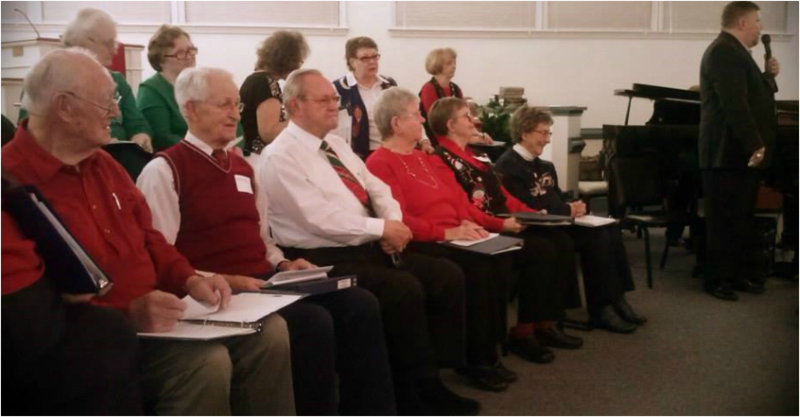 Following the meal, we will enjoy a wonderful Christmas music program presented by the talented-and-fun Friendship Singers, pictured below. Your $50 gift (larger gifts accepted) will pay for our Ark Pond restoration. Menu: Roast pork loin w/ raspberry sauce, Parmesan-crusted chicken w/ lemon butter sauce, Mashed potatoes w/ gravy, Green beans, Hot rolls w/ apple butter, Tossed salad, Carrot cake w/ cream cheese icing, Drinks, Coffee and Hot Chocolate. Our collective support of Camp Bethel puts TOGETHERness into practice as described in Acts 2:43-47. Call, e-mail or mail in your individual, family, class or congregational reservation by November 28, 2015 to 540-992-2940 or CampBethelOffice@gmail.com. Snow date is December 10 at 6:30pm.